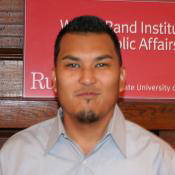 Josue earned his undergraduate degree in Psychology and his Master in Public Administration with a concentration in Public Management from Rutgers–Camden. Josue was the Graduate Assistant at WRI and worked directly with the Institute’s Associate Director on finances and grants management. This page was printed from http://rand.camden.rutgers.edu/2014/02/18/duque-josue/ at 8:24 PM Saturday, April 20, 2019.